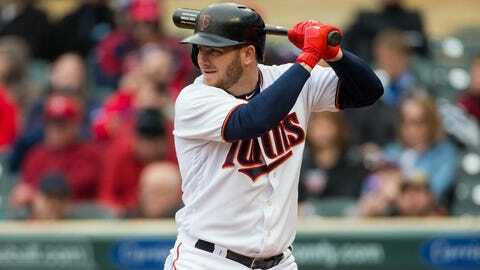 The Minnesota Twins placed outfielder Robbie Grossman on the 10-day disabled list Monday morning with a hamstring injury. Grossman has appeared in 92 games for the Twins this season, hitting .253 with four home runs in 277 at-bats. Fellow outfielder Johnny Field, claimed Friday off waivers from the Cleveland Indians, was recalled from Triple-A Rochester to replace Grossman on the 25-man roster. A rookie, Field started the season with the Tampa Bay Rays, but was designated for assignment after 62 games, landing with the Indians, and eventually the Twins. Originally drafted by the Rays in 2013, Field is hitting .213 with nine doubles and six home runs in 169 at-bats at the major-league level. Field has also spent 17 games with the Rays, Indians and Twins’ Triple-A affiliates this season, hitting .333 with five doubles and a home run.